Jan. 5, 2017 - Forestry and off-road equipment operators and maintenance technicians are used to dealing with obvious dangers from spinning saws and falling tree limbs, but may be less familiar with a critical danger that can cause crippling injuries or death – high-pressure injection injuries. 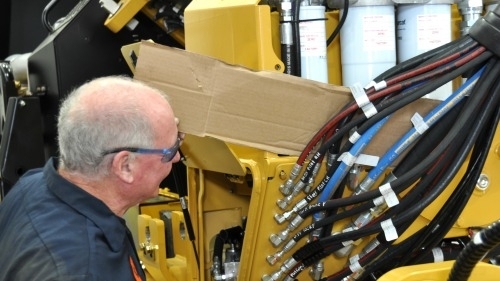 A technician checking for hydraulic leaks using a sheet of cardboard. With heavy equipment, the most potent threat comes from high-pressure hydraulic leaks. A tiny break or pin hole in a hydraulic line or a failure of a fitting and can release hydraulic fluid in an almost invisible stream at over 200 bar (3,000 psi). 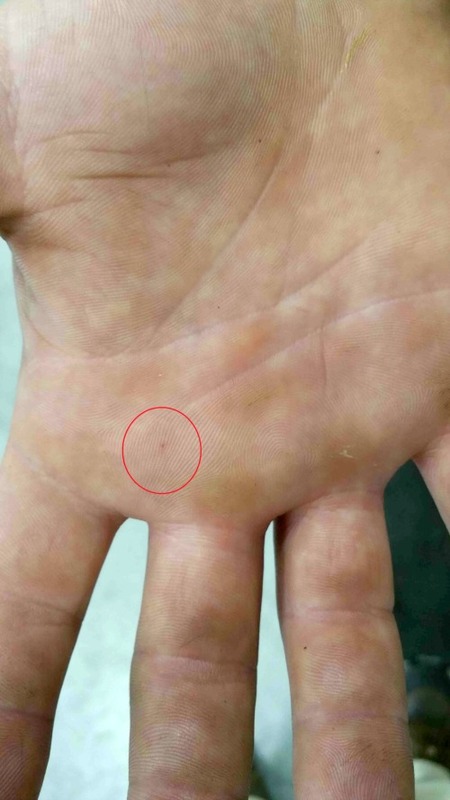 If technicians or operators are searching for a leak with their hands or investigating some unrelated problem, they might feel a sting similar to an insect bite or a sharp wire cut and not consider it serious at first. The wound may not even appear that severe – just a cut or red mark like an insect bite. Mechanics get bumps and scrapes on their hands all the time, after all, and wasps can nest in machinery that lives in the woods. However, within a few hours, the injury will cause excruciating pain and require immediate and specialized surgery. The longer emergency treatment is delayed, the higher the risk of permanent injuries such as losing fingers, the whole hand or even death. What happens is that high-pressure fluid is injected deep under the skin into the blood stream, muscles and tendons. The fluid itself can cause serious damage to tissue depending on the type, but just the pressure alone can rapidly cause swelling of enclosed compartments within the limb leading to painful damage to tendons, arteries, nerves and muscles. Hydraulic fluid or fuel entering the bloodstream can quickly result in death since the human body has no defense against it. If that weren’t serious enough, bacteria can be driven deeply into the wound causing dangerous infections. Only specialized surgery performed very soon after the injury prevents permanent disability. Always wear personal protective equipment (PPE) such as safety glasses and gloves, but be aware that high-pressure fluid can penetrate even heavy welding gloves. Never assume a machine’s hydraulic system is depressurized just because the machine is turned off. Lines or accumulators can hold residual pressure for weeks or even months with the engine turned off. Consult the operator’s manual for the specific depressurization procedure for the machine. Remember, however, that there is no definitive way to tell if a system is fully depressurized so always be cautious. Never use your hand – even wearing a heavy glove – to grab a hydraulic line or search for leaks. Always place the far end of a long object such as a piece of cardboard, wood or steel in the suspected path of any fluid stream to localize a leak. Besides training technicians and operators, companies and dealers working with heavy equipment should put plans in place for dealing with injection injuries. Local medical facilities should be alerted that they may see these kinds of injuries (which require specialist treatment) and there should be evacuation plans in place for crews working in remote locations. Make sure the Material Safety Data Sheets (MSDS) for any fluids in use (hydraulic fluid, fuel, paint and so on) are readily available and provided to emergency personnel. If an incident does occur, injured workers must be transported to hospital as quickly as possible since time is of the essence. Surgery must be immediate to relieve pressure and remove injectate from the wound. 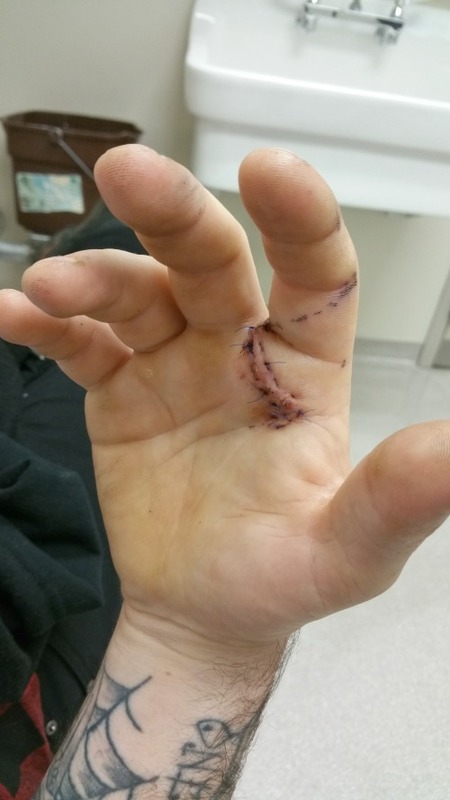 Both victims and emergency room personnel can sometimes be reluctant to proceed to this step because the outside appearance of the wound can seem very minor, but it is essential that these kinds of injuries be treated as immediate surgical emergencies. While this article has focused on the dangers of hydraulic fluid injuries, it is also important to remember that injection injuries can happen with any substance under as little as 7 bar (100 psi) pressure – even water or air. Many common maintenance shop activities such as pressure washing, painting, clearing debris with compressed air and use of a high-pressure grease gun can also result in injection injuries. Always wear the proper protective equipment for the job and take responsibility for your safety and the safety of your coworkers. Beware of the bite!